It didn’t take long before I found myself slamming my mouse in frustration. Not because I was annoyed with Battlecry. Far from it: I think it’s going to be very good. I was slamming my mouse down because I wanted to win at Battlecry. For a game that’s barely in beta, Battlecry is doing a lot of things very, very right. 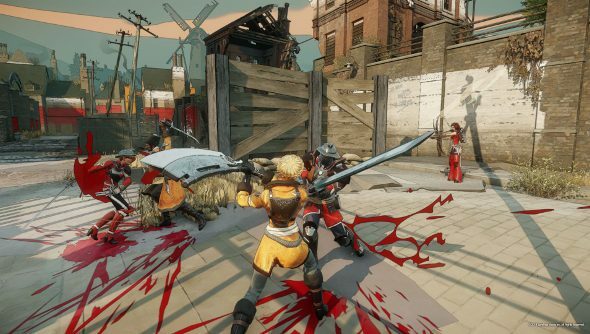 Hold up: Battlecry is a very fast paced team combat game, played from third-person. It is a slightly unusual prospect: the game is set in a world where gunpowder has been outlawed, and magic sort of exists. Disagreements are solved by sending teams of warriors into arenas to fight. You pick a character class, leap into action, and slice, dice, and occasionally turn your foes into pincushions. It is a good time. It’s also beautiful. 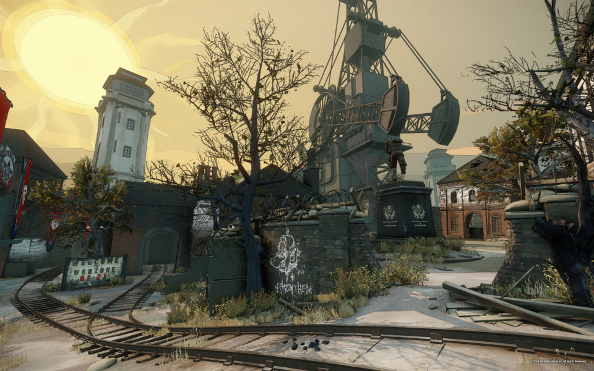 It looks somewhere between TF2 and Dishonored: a very slightly cartoonish take on 18th century warfare. Think of the two sides, the Royal Marines and the Cossacks, as Napoleonic foes: albeit ones that can turn themselves invisible, and use grapple points to parkour their way over the rooftops. It’s a game that relies on careful team-play. There are currently three classes implemented: a heavy bruiser class (Enforcer) that uses a shield and sword, an assassin (Duellist) that can cloak, appearing behind people to skewer them on a pair of rapiers, and a ranged archer class that tends to stand near the back, whittling down the opposing team. They’re pleasingly diverse: on the Cossack’s side, the beefiest class in the game, the Enforcer, is a physically fit, but not ludicrously proportioned blonde woman, complete with roses in her hair. Score one for team diversity. When the teamplay clicks, it’s ludicrously empowering. I started to love Battlecry when I realised, as an Enforcer, I could use my shield to tank multiple enemies at once. I gained the attention of two archers and gradually peeled them away from my enemy’s group. My reward: seeing a duellist decloak behind them and cut them to ribbons. In revenge, an army of Enforcers charged me down, seeking revenge for their fallen comrade. It helps that Battlecry is absurdly gratuitous. That sort of cartoon styling allows the game to show gibs flying, claret splattering, and goo spinning in all directions. When you die, your corpse bounces off the walls and floor, frequently missing an arm, leg and/or head. And when you make a kill, particularly from up-close, there’s a sense of satisfaction at inflicting brutality that I’ve missed from recent FPS games. But it’s tinged with a sense of honour and prestige. At any moment you can salute, not taunt, your team and your enemies. At the end of the match, you’ll earn just as many resources for losing if you find the best scoring enemies and offer them a salute. As I leave, I chat to a member of the opposing team. Turns out, they were all part of a clan, and had prepared a battleplan. Their teamwork clearly paid off. They leave, buzzing, chatting about how they used complimentary skills to take us down. I hear one gloating. I leave the match frustrated. Frustrated at being kicked off the machine to let someone else play. Frustrated at losing to a superior team. And frustrated that Battlecry won’t be available until next year.